Best suffered the injury during Saturday’s 21-18 loss to Leinster in a European Champions Cup quarter-final at the Aviva Stadium, Dublin. He had rolled back on the ankle at a ruck and although it was strapped up at the time, he soldiered on for eight minutes before finally coming off in the 16th minute. He had already made a huge impact on the game by that stage, charging down a kick which saw Kieran Treadwell score the opening try and his influence around the ruck and maul was evident. Skills coach, Dan Soper, revealed earlier this week that the talismanic Ulster figure wanted to play on but decided he did not want to let his team mates down and opted to come off. Ulster Rugby confirmed on Tuesday morning that Best would, as expected, miss Friday night’s Guinness PRO14 game in Glasgow, but speaking at an event in Dublin later where he was unveiled as ambassador for Specsavers Audiologists’ ‘Don’t Suffer in Silence’ campaign, Best revealed the medics had put a six-week time period on a potential return. That could mean Best would still feature for his club side before the end of the season if they reached the PRO14 play-offs. Best is due to retire from international rugby at the end of the Rugby World Cup this autumn and talks around his Ulster future post that are still ongoing. On Tuesday Best told 42.ie: “It’s (the ankle) not too bad. I think given the nature of how the injury happened, and the nature of some of the injuries that happened on that day and in the past, realistically it’s probably as good as it could have been. “There is no structural damage, just little bit of a wrenching of the ligaments really. “They (Ulster’s medical team) have given this magical figure of six weeks but are not really sure because a lot of it will depend on, when I come out of the boot, how I weight bare, how I run and if the swelling comes out quickly. “So I still hope to play again for Ulster this season, which is important for me. “A little bit of that will depend on how long our season goes. Obviously, if it finishes after the Leinster game, it leaves it very tight. But if we can make play-offs, it gives me a good opportunity,” added Best. 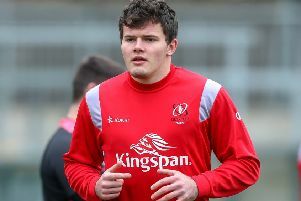 The good news is the injury will not impact on Best’s Ireland World Cup hopes.